On the afternoon of April 7th, there was a terrorist attack in Stockholm, about three blocks away from where I was working on a video project. As we were wrapping up the filming, we could hear sirens and saw several police cars driving towards the city center. We were loading up the video equipment to move on to the next location when the crew got messages about what had happened. All we knew at that time was that a truck had driven onto a busy pedestrian street and drove into a busy department store. It was chaos and we drove away from the area to get to the next location. We tried to continue filming but soon stopped as everyone was quite concerned and wanted to get home to their families so we postponed the rest of the filming to another day. Stockholm is a small city and we probably only have two degrees of separation max when it comes to knowing people. I actually had a friend who was sitting right above where the truck drove into the department store and she felt the impact and knew something was wrong. What she told me afterwards–and what she consciously chose to focus in on—was the amount of love and heroism from all the people. I believe humanity has a natural ability to reach out and support each other, especially in times of trouble. We (for the most part!) are hardwired to care and have empathy for each other. And this event was an example of this. Because afterwards, people who lived in the city center were posting on Facebook, opening up their homes to people who got stranded in the city (all the trainings and metro systems shut down immediately) and were driving people home. There are countless stories of people choosing to help and support each other in whatever ways they could afterwards. Someone decided to have a LOVE demonstration two days later and posted about it on Facebook Friday evening. I believe it was one of the biggest turnouts and a strong message of solidarity for Sweden that we choose love over fear. Swedes refuse to allow the insane actions of a few people ruin what Sweden stands for—an open and trusting society. I’m so happy to know that our underlying values in this country are strong. And yes, even though there are still problems, if the vast majority can choose love over fear each and every day, we will make great progress to creating a world in which we all want to live. This small little action is something to keep in mind each and every day, no matter what you do. And collectively, we can—and will—change the world! This 2 minute video shows what happened that day at the peace demonstration. It was made by Herman Caroan, a very talented videographer, and immediately went viral. 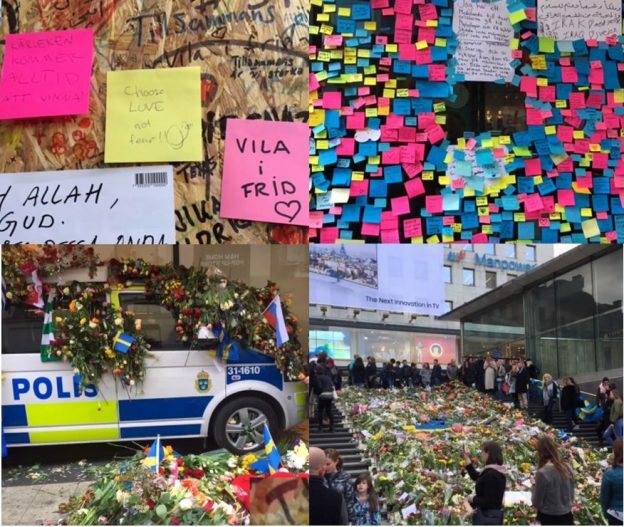 This entry was posted in Inspiration, Purpose, Uncategorized and tagged fear, love, solidarity, Stockholm, Sweden, terror attack on April 17, 2017 by Karin Volo.